All around the world, different cultures commemorate the arrival of the new year with a variety of traditional meals, celebrations, and activities; in the south, hog jowls are eaten symbolically on New Year's Day to represent health, prosperity, and progress in the coming year. A hog jowl is a cut of pork that could be considered the "cheek" of the hog; it tastes and cooks similar to thick-cut bacon and is a tough cut that is typically smoked and cured. Hog jowl is usually used in the South on New Year's Day to season beans and peas, but it can also be fried and eaten like bacon year-round. If you're traveling to Little Rock, Arkansas, this year for your New Year's Eve celebrations, there are fortunately a few places you may be able to sample this traditional southern dish, but you can also easily make it yourself at home if you know how to do it and what to use it for. The south isn't the only place that eats pork on New Year's Day as a sign of health, prosperity, and progress. All over the world, people are using marzipan pigs to decorate their tables or partaking in pig's feet, pork sausage, roast suckling pig, or pork dumplings in hopes of bringing a little extra wealth and health their way in the coming year. As such, hogs and pigs have long been a symbol of prosperity and gluttony—it's why we say someone is "being a pig" when they take more than their share. Furthermore, some cultures believe that the bigger pig you eat on New Year's Day, the bigger your wallet will be in the coming year. 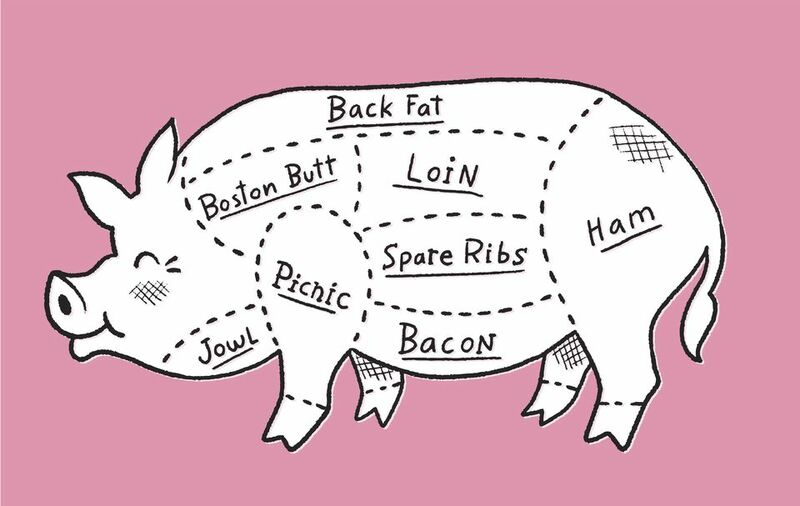 However, the south is one of the few places that uses pig jowls instead of other cuts of a hog to for their holiday meal. In Little Rock and other poor, rural areas, pigs were considered symbolic of both health and wealth because families could eat the fatty meat one pig produced for the entire season. As a result, having pork could mean the difference between life and death in a really cold winter. The residents of Little Rock eat hearty soul foods in the winter because the harsh conditions make protein-rich food sources scarce even while residents need more nutrients to survive the colder climate. Fortunately, cured meats like hog jowls can be stored for long periods and can be pulled out and prepared all season long to provide a nutrient-rich addition to any meal. While most other meats are harder to find in the winter, cured pork can be used most of the season to flavor a number of dishes, including black-eyed pea and collard greens. Alternatively, it can be fried up and cooked similar to bacon but will be a bit tougher and take a little longer to prepare. Jowl typically comes in a package, sliced like thick bacon or uncut on the "rind." You can leave the rind on, but it's hard to cut through and almost impossible to chew. Most people remove the rind, slice it, and fry the slices in a skillet, like bacon, until brown on both sides before then draining it on a paper towel and serving it to family and friends. Since it's a cured food, hog jowl typically doesn't need extra salt, but some like to serve it with pepper or hot sauce. If you're a true Southerner, you can drizzle the pan drippings over a salad or Brussels sprouts, and you can even make really good cornbread with pork fat. Heritage Grille Steak & Fin: Located inside the Little Rock Marriott, will be serving a prix fixe meals on both New Year's Eve and Day. Cache Restaurant: This fine-dining restaurant will have two seatings for their holiday meal on New Year's Eve, and tickets include access to the party upstairs after dinner is served. Ya Ya's Euro Bistro: This southern-inspired European restaurant will be serving their full menu on New Year's Day and Eve, and your NYE meal includes entry to a themed party afterward. Many other restaurants will be open on New Year's Eve and New Year's Day this year but do not have accompanying parties to attend as well. Wherever you go, though, you should be sure to call ahead to make a reservation, especially if you're looking specifically for pork jowls. While many southern-style restaurants and venues may have this traditional ingredient in their peas and cabbage dishes, you should ask the host or waiter to make sure.